Wilfully Obscure: St. Lenox - Ten Songs About Memory and Hope (2015, Anyway) - A brief overview. 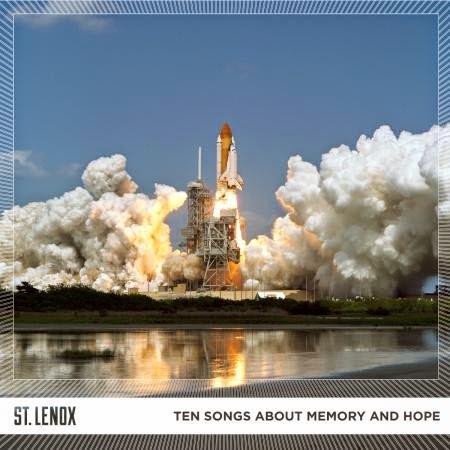 St. Lenox - Ten Songs About Memory and Hope (2015, Anyway) - A brief overview. Hearing an album as dazzling and ingenious as St. Lenox's Ten Songs About Memory and Hope, makes me wish I wasn't so damn genre-centric. Some twenty plus years ago, if a band wasn't donning flannel and/or playing through a Marshall stack with a clutch of effects pedals at their feet I likely wouldn't touch them. My tastes have broadbanded considerably since, but were you to explain St. Lenox's electronica meets R&B premise on paper, I'd still be nothing short of skeptic. And I was, until I relented and let the Andy Choi-helmed Brooklyn by way of Ohio outfit reveal an aural craving that I never caught wind of per my own volition. Let it be known to the uninitiated Mr. Choi possess a powerful, and frankly enviable croon. I've already an encountered a comparison to Cee Lo Green, but to this pair of ears, I'd more accurately slot his soaring, penetratingly melodic timbre somewhere between Stevie Wonder and Adam Levine. But upon deeper investigation I've discovered that beyond those likenesses, Choi possesses something all the more indigenous and captivating, a la Jeff Buckley or Rufus Wainwright. Yep folks, this gent is that utterly compelling. Vocal intonations aside, Ten Songs... could survive on it's own in the hands of virtually any mouthpiece utilizing Choi's ornate, slice-of-life by way of stream-of-consciousness narratives. "To Be Young Again," and "I Still Dream of the '90s" tuck wry cultural references into deeper ruminations on the not too-distant past, and a future which may not bear quite as much promise. Segueing into an even more pensive context, "Map of the World" is a classicist piano ballad, that in a more perfect world would have the Grammy nominating committees beckoning. Despite it's rich, soulful moxie, there's not much on 10 Songs... that could pass for dance music. To the contrary, St. Lenox's fidgety array of electronic treatments reside amidst moderately paced beats, occasionally flirting within sublime classical arrangements to boot (check out "Pop Song 2012"). Too complex to be cast off as a mere pop album, I'm awfully hesitant (and sloth) to offer extrapolating song-by-song dissections. Instead I'll encourage you to acquaint yourself with this intoxicating creation via a four-song taster available on Bandcamp. The physical version of the record drops this week on Anyway Records, and it's available digitally from iTunes and Amazon. If you ever miss me, I will always miss you more. Pawn the diamond ring, no space for you to cling. Best of the blog mix for 2014.